If you are struggling to keep up with your credit card debt, follow these steps to guard against becoming delinquent on your accounts. Open all bills as soon as you get them. Procrastinators often let their credit card statements and other bills pile up, which can result in missed payment deadlines and late fees. 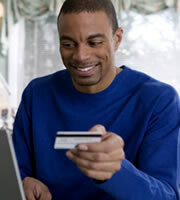 Credit card late fees average $34.35, according to the latest IndexCreditCards.com survey. That's about the same as a monthly payment on a $2,900 balance carrying a 14% interest rate. Read credit card terms carefully so you know the deadline for mailing payments. Most credit card statements have the exact date and time that payments are due, regardless of whether they are sent electronically or by mail. The terms also disclose circumstances under which interest may change and affect your payments. Look for low interest credit cards to make your payments more manageable. If you sign up for a card with an introductory interest rate, keep track of when the rate will increase so you aren't surprised by higher payments. Compare credit card offers to make sure you are getting the best deal. Credit card rates are averaging 15.39% after many credit card issuers recently raised their rates. People with excellent credit have an average rate of 11.86%. Spend some time reviewing your credit report and credit score to find out where you stand. Stop using your credit card. You may be trapped in a cycle of spending and running up debt that can only get worse unless you get serious about cutting out unnecessary expenses. If you are using credit cards to buy necessities like food and medicine, focus on cutting your other expenses and/or boosting your income. Get debt counseling if necessary. It can be overwhelming to tackle thousands of dollars in debt. A reputable credit counselor can guide you on putting together a budget, cutting expenses, and learning better techniques for managing your finances. Avoiding delinquency on credit cards can lessen the chances that you will ultimately end up in bankruptcy. Both delinquency and bankruptcy damage your credit history, with consequences lasting for years, so it's worth doing what it takes in order to keep credit card accounts current. 0 Responses to "Six Steps to Avoid Credit Card Delinquency"